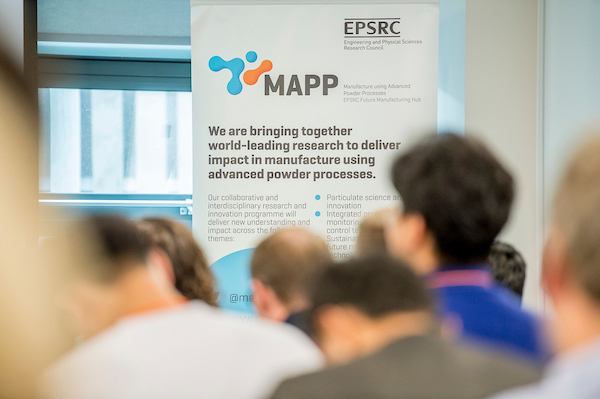 MAPP hosted the third Alloys for Additive Manufacturing Symposium (AAMS) in September 2018. AAMS is a Europe-wide additive manufacturing (AM) symposium which has previously been hosted by the Max-Plank Institute in Germany in 2016 and EMPA in Switzerland in 2017. 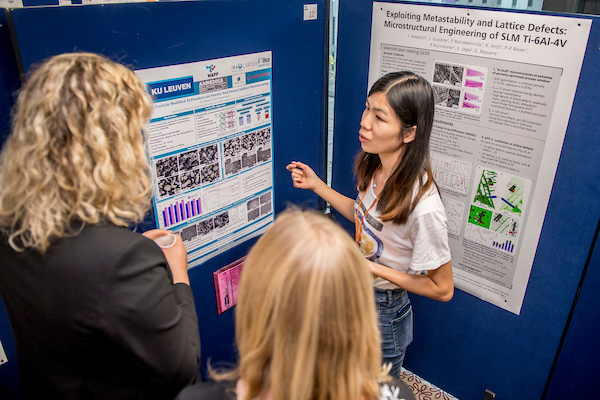 The two-day symposium brought together over 100 international delegates from academia and industry to discuss recent research advances in metal AM across five themes: phase transformations in AM-produced alloys, alloy design, advances in processing, structural control by design, and novel concepts in alloy metamaterials. The format of the symposium was a series of sessions focused around one of the themes, each session started with one or two invited keynote speakers followed by several shorter talks. The symposium included a poster session, which was well represented by early career researchers and PhD students. Professor Iain Todd, MAPP Director, welcomed delegates and gave some background to the event. He outlined his two hopes for the conference – that delegates see something new which stimulates a different viewpoint and that they find new collaborators from within and outside this growing community. The two sessions on Alloy Design featured keynote presentations by Prof. Roger Reed from the University of Oxford, Dr Blanka Szost from Oerlikon and Dr Phil Carroll from LPW Technology. Roger presented a talk entitled ‘New Nickel-based Superalloys for AM by Alloys-By-Design Approach’ in which he outlined some of the challenges and approaches to designing complex superalloys. Microstructure control during processing is the key challenge and many existing ‘heritage’ alloys are not appropriate for AM. The approach at Oxford, and the spinout company OxMet Technologies, considers and optimises a number of design parameters, such as creep resistance, oxidation resistance and manufacturability, and uses high throughput techniques to screen and down select the most promising candidates. Small scale tests of the materials, such as weldability, are required in the down selection process before moving to powder production. The team at Oxford has developed a new generation Ni alloys which overcome problems such as lack of fusion and edge cracking in AM. Blanka gave an overview of alloy design approaches at Oerlikon and a case study on Hastelloy X, an alloy with a very narrow window of AM processability. Oerlikon had recently acquired a company called Scoperta, with expertise in metallurgy informatics and algorithmic mining to screen new alloy chemistries – using these approaches Oerlikon had identified a number of alloys which would be more amenable to processing. Phil gave a realistic view from the perspective of a metal powder producer and supplier. Alloy development is high risk and not in his top three commercial considerations – these were safety, economics and consistency (in that order). Phil also highlighted the extremely long development times – Inconel 718, one the best selling powder materials was originally patented in 1959 and Ti/Al materials that were developed in the 1970s were only just starting to see early application in AM. LPW’s focus was on data-driven optimisation, using data to give confidence in powder quality (e.g. oxygen pick-up), improving powder reuse rates and thus reducing the final cost of parts. 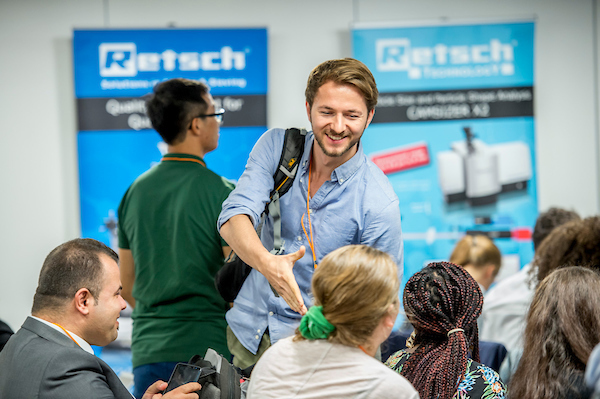 Florian Hengsbach from Paderborn University presented a talk entitled ‘Processing surface inoculated ferritic steel powder via selective laser melting – microstructural and mechanical properties’. Inoculants are commonly used in casting to control grain size and the approach had recently been applied successfully to AM of aluminum alloys. Florian gave an overview of the approach in steel alloys and some of the challenges faced, which included ensuring fine dispersions of the inoculant particles and optimising the process parameters to the new chemistries. Dr Behrang Poorganji gave an overview of material development at GE Additive, highlighting a key challenge in the materials development sequence – applying the down selection during screening of materials where an educated eye was needed. Dr Ian Mellor gave an overview of the Metalysis Process, a solid state electrochemical process which produces metal powders through the reduction of oxide powders. There are a lot of advantages to the Metalysis approach including the ability to manufacture complex alloys of elements with vastly different melting temperatures. Metalysis are well advanced with the scale-up of production capability with the latest generation of modular reactors producing 10s of tonnes per annum of Titanium and Tantalum. Prof. Eduard Hryha from Chalmers University of Technology gave a keynote entitled ‘Material and powder solutions for powder-based additive manufacturing’. Sweden produces 25% of metal powders globally and CAM2, a national centre of competence in AM had been set up to meet the needs of industry. AM users buy powder and process and there are currently 24 qualified powders (with processing parameters) for laser powder bed AM and 4 qualified powders for electron beam powder bed AM. Dr Christian Leinenbach from EMPA talked about the influence of thermal history on defects and grain microstructure in SLM parts and how re-scanning of a built layer can offer a route to additional in-process microstructure control. This was demonstrated in titanium parts with synchrotron experiments providing insights on the mechanisms of phase transformations. Dr Sam Clark from University College London presented a talk on ‘In situ synchrotron quantification of microstructural feature phase and morphological evolution in Stainless Steel’ where x-ray diffraction was used to show phase transformation during processing with high time resolution. Dr Matteo Seita from Nanyang Technological University presented a paper entitled ‘High-resolution powder bed scanner for in-line defect detection and characterization during additive manufacturing’. One of the challenges with AM is developing metrology approaches which can quickly and cost effectively identify defects during the build. Matteo used a flatbed scanner to monitor the powder bed after recoating with fresh powder and the system was able to pick up defects as out of focus regions from the scan. 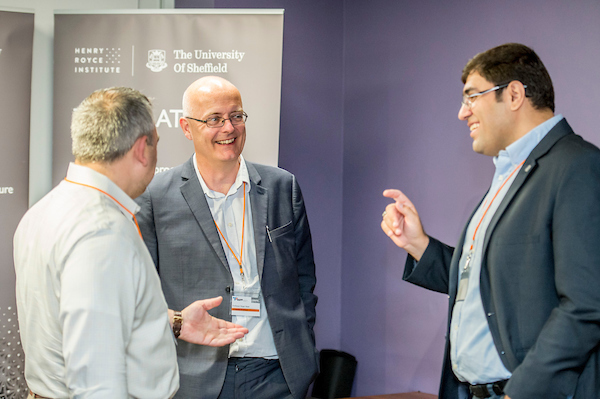 Dr Hector Basolato from the University of Birmingham gave a keynote entitled ‘A stochastic multiscale modelling approach to additive manufacturing of nickel-based superalloys’. Hector is developing predictive models for AM which can help overcome some of the problems in processing nickel alloys such as cracking. The team had recently won a NIST benchmarking challenge with their modelling results predicting the phase evolution during residual stress annealing of an INC625 alloy AM part. 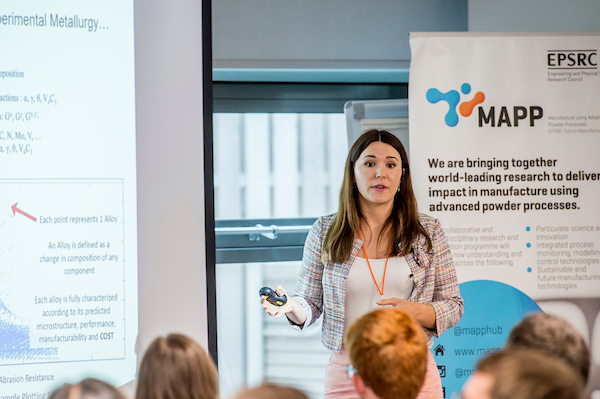 Dr Marie Fischer from Chalmers University of Technology presented a novel approach to the production of alloyed components by mixing and selective laser melting elemental powders. Ti-26-Nb is a high strength low elastic modulus alloy and a good candidate for biomedical applications potentially circumventing bone loss around implants due to modulus mismatch. AM processing and the production of alloyed components was achievable, with properties equivalent to those produced from pre-alloyed powders and the approach opens up a range of interesting possibilities. Mr Philipp Kürnsteiner from Max-Planck-Institut für Eisenforschung presented a talk on ‘Designing Fe-Ni-Al and Fe-Ni-Ti Maraging steels tailor-made for Laser Metal Deposition by exploiting Intrinsic Heat Treatment’. The intrinsic heat treatment from layer by layer processing in AM offer the potential to tailor component properties via mechanisms such as precipitation hardening but requires the right alloy chemistry and process parameters. 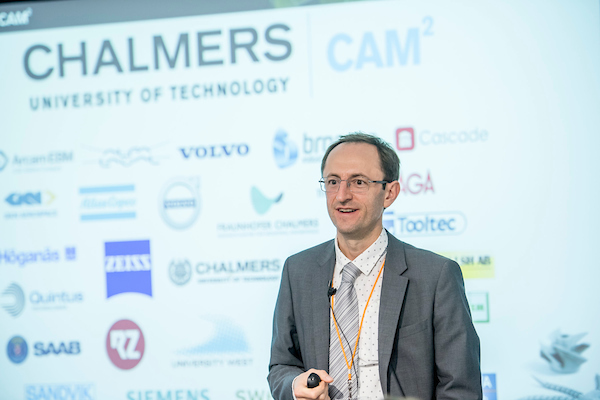 Dr Eric A. Jägle from the Max-Planck-Institut für Eisenforschung gave a keynote on ‘Impact of the process gas atmosphere in Laser Additive Manufacturing – desired and undesired effects’. Eric posed the question ‘if we don’t have perfect atmospheres in the machines, can we exploit it?’ The use of, for example, oxygen and nitrogen within the machine could offer routes to changing material and surface properties via oxide dispersion formation or nitride formation. Initial results explored the addition of carbon dioxide and argon in the atmosphere with some interesting results on oxygen pick up and loss in the materials. Dr Ida Berglund from QuesTek Europe gave an overview of Questek’s ‘Materials by Design’ integrated computational materials engineering (ICME) approach to alloy discovery and development. Questek was established in 1997 and Questek Europe was a recent venture with Thermo-Calc. The company has developed a number of computationally designed steels which are deployed in demanding aerospace and space applications. The company has a number of projects on alloy development for AM including development of high strength aluminium alloys which can be processed by AM, looking to eliminate the problems of hot-tearing and hot-cracking. It is expensive to produce new powder materials and small scale tests – such as weld crack sensitivity - are needed to help validate models and provide confidence in the down selection process. Dr Christopher M. Spadaccini for Lawrence Livermore National Laboratory drew the conference to a close with a keynote entitled ‘Additive Manufacturing and Architected Materials: New Process Development and Materials’. Design is now one of the bottlenecks in AM development and Chris showed work from LLNL on computer driven optimisation of novel structures to tune component mechanical properties. Using these approaches the team were able to get into areas on Ashby Property Charts which were difficult to achieve by any other means, such as combinations of low density and high strength. Finally, Chris also showed some recent exciting work on polymer AM using holographic type approaches to photocure components in a volumetric approach, rather than a layer by layer approach, which could rapidly increase the speed of polymer AM. There were a lot of common themes throughout the event, one of the key themes being common approach to alloy development – starting with the screening of large numbers of potential new alloys in silico employing data and models, moving to small scale tests to predict likely behavior in process and de-risk the development before moving to the (expensive) production of new powders. The link between experimental data and models is key to continuously improve and develop the predictive capability of the models. The link between chemistry and process is also critical and the ability to explore new processing windows with new materials is being enabled by some new, open and more flexible AM machines, and these approaches are essential to move the field forward. 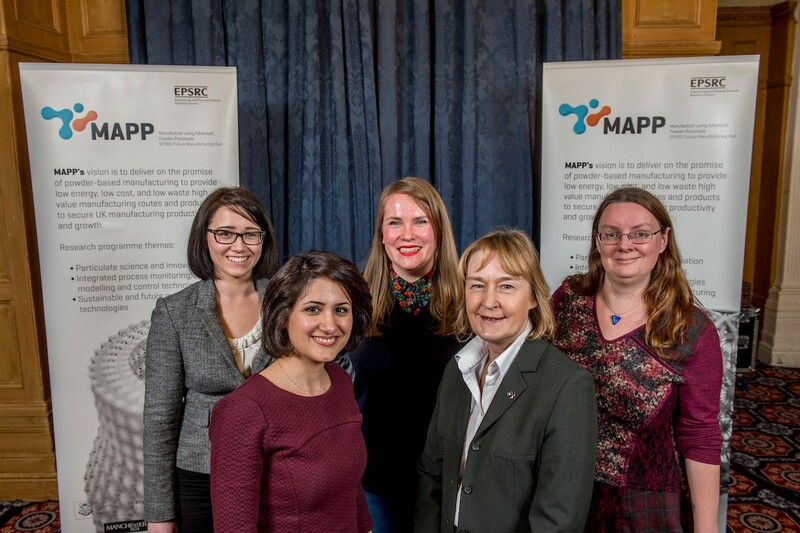 The format of the event gave plenty of opportunity for networking and this coupled with the size of the symposium meant that delegates were able to talk to each other and forge new connections. The next AAMS event will be held in Gottenburg, the spiritual home of electron beam AM, and is scheduled for 18th & 19th September 2019. Guest blog: Powders for Additive Manufacturing: There’s a MAPP for That!